Every year this prominent event unites thousands of marketing professionals from more than 80 countries. They tap into cutting-edge strategies from the giants of the affiliate marketing industry and build a network with peers. 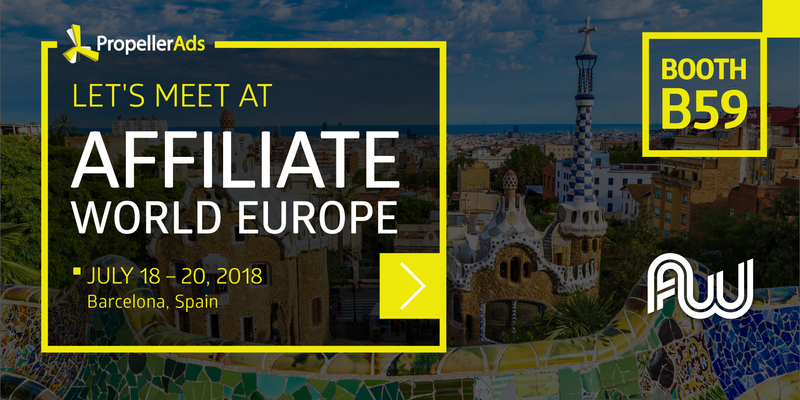 You can do the same – simply visit the upcoming Affiliate World Europe Conference, which will be held in Barcelona on July 18-20. It’s already the third time the PropellerAds Team is attending the Affiliate World conference. We collaborate with the top affiliate marketers and can’t wait to discuss with all of you, our potential cooperation, future projects, and introduce our best new products. Native Push Notifications. Premium advertising tool with instant message delivery and CTR up to 15%. You can learn even more info on this format if you watch our recent webinar. Native Interstitials. Customizable ads that were enriched with native features (you can now add the content!). Get the firsthand information about this format at our booth! These ad formats have already proved to deliver solid results for our partners – your turn to test. After all this running from one stand to another, you deserve to soothe your aching muscles at the massage area set up by PropellerAds. Treat yourself to a nice rubdown! Want to book a meeting with us in advance? Click the button below, and our team will get in touch with you shortly.